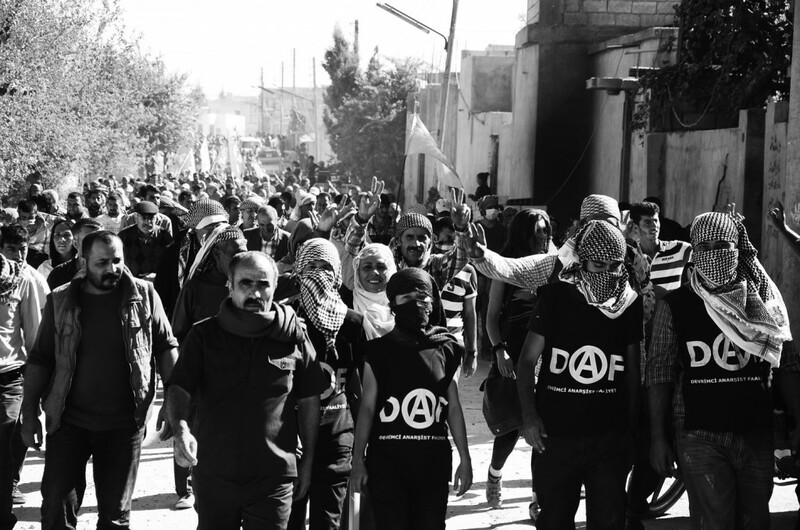 Note from Meydan Anarchist Gazette: For two years now, the foundations of social revolution have been developing in Rojava, (West Kurdistan). Bearing this in mind, it’s hard to deny that Turkish state interests and the prerogatives of global capitalism form part of the basis for the ongoing attacks against Kobanê. 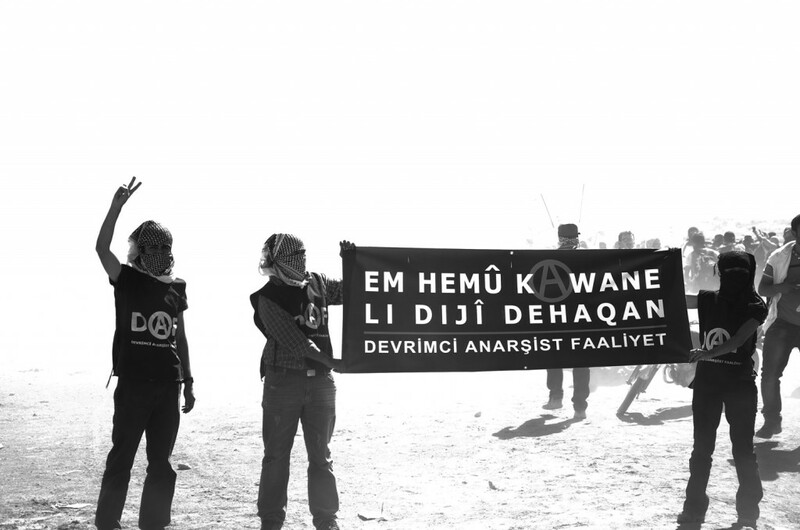 Abdülmelik Yalcin and Merve Dilber from Revolutionary Anarchist Action (DAF) have been in the region of Suruç (over the Syrian-Turkish border from Kobanê), in solidarity with the people of the region, since the resistance against attempts to obscure the people’s revolution began there. We interviewed them about the Kobanê Resistance and the Rojava Revolution. MAG: Since the beginning of the Kobanê Resistance, you have organized a lot of protests and made leaflets and posters. You also participated in “the human chain border watch” that was organized in the villages at Suruç, near Kobanê. What was your purpose in going there? Could you tell us about what you experienced there? Merve Dilber: Due to the Rojava Revolution, the borders between the parts of Kurdistan that fell within Syrian and Turkish territory started to melt away. The Turkish State even tried to build a wall to destroy this effect of the revolution. In the midst of a war driven by the interests of global capitalism and states in the region, the Kurdish people in Syria took a step along the path that leads to social revolution. Thanks to this step a real front emerged that leads to the freedom of the people, and in Kobanê, a total attack against revolution was started by ISIS, the violent mob produced by global capitalism. As revolutionary anarchists, when we considered the situation in Kobanê and all of Rojava, it was impossible for us not to become directly involved in it. Borders between states are being abolished. It is vital to stand in solidarity with the people resisting in Kobanê. We are at the fifteenth month of the Rojava Revolution. In these fifteen months, we organized a lot of joint protests and launched leafleting and wheatpasting actions. During the latest wave of attacks against the revolution, in Kobanê, we redoubled these efforts. But we went to the Kobanê border region mainly to salute the Kurdish people’s struggle for freedom against the attacks of the ISIS mob. During the night of 24 September we departed from Istanbul toward the Turkish/Syrian border. We met our comrades who arrived a little bit earlier, and together we started our human chain border guard in Boydê village, to the west of Kobanê. There were hundreds of volunteers like us who came to the border, from different parts of Anatolia and Mesopotamia, and formed a human chain along 25km of the borderline, in various villages like Boydê, Bethê, Etmankê and Dewşan. One of the aims of the human chain was to stop men, arms and logistical support reaching ISIS from the Turkish state, whose support of ISIS is known by everyone. Another aim of our border watch was to interfere with Turkish border police, in solidarity with the people of Kobanê trying to escape, who were delayed at the border for weeks and were even attacked by Turkish military police forces (jandarma). In the first days of our border watch actions, we cut the wires and crossed into Kobanê together with people coming from Istanbul. MAG: Could you please tell us what happened after you crossed the border to Kobanê? Abdülmelik Yalcin: The moment we crossed the border, we were greeted with huge enthusiasm. In the border villages of Kobanê, everyone, young and old, were on the streets. YPG and YPJ guerrillas saluted our elimination of borders by firing into the air. 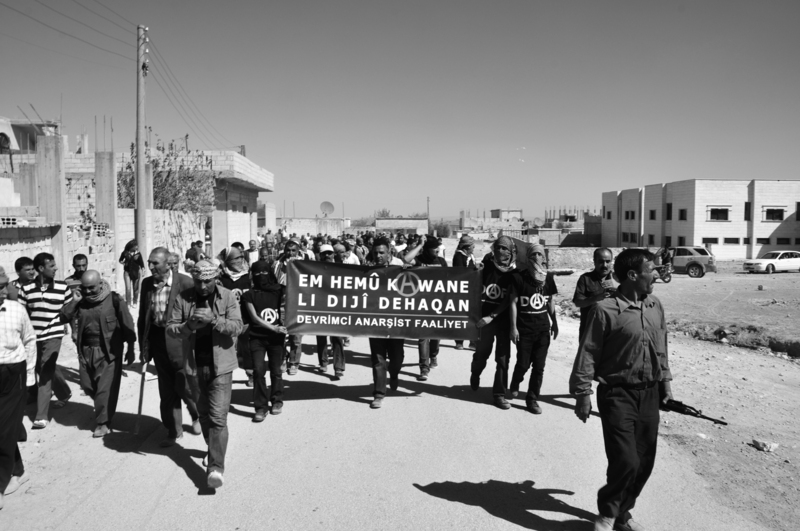 We rallied in the streets of Kobanê. Later, we had conversations with the people of Kobanê and with the YPG/YPJ guerrillas who are defending the revolution. It is very important that borders between people, erected by states, be smashed like this. This action, which occurred in the conditions of war, shows once more that uprisings and revolutions cannot be stopped by the borders of states. MAG: There has been a lot of news about people who participated in the “human chain border watch,” and about the rural population around the border being attacked by military police and regular cops. What is the Turkish state trying to achieve with its bullying at the border? AY: Yes, it is true that the policy of the Turkish state is to attack everyone who is involved in the border watch and who lives in the border villages, and everyone from Kobanê who tries to cross the border. These attacks happen frequently and sometimes they last for days. It is obvious that each attack has its own excuse as well as its own purpose. We observed that during nearly every military (jandarma) attack, trucks transport some stuff to the other side of the border. We are not sure about the exact contents of these shipments to ISIS. However, we understood by the scale of the attacks that they were mostly diversions—sometimes to let people across the border to join ISIS, sometimes to send arms, and other times to provide ISIS with its daily needs. These shipments were sometimes carried by vehicles with official plate numbers and sometimes by gangs involved in state-sponsored smuggling. Moreover, these state-sponsored gangs seized the belongings of the people of Kobanê waiting at the border. Military police, for their part, let people cross the border only with a commission fee of thirty percent. The policies of the state against the local population have been the same for years. Due to the conditions of war, this policy has become much more visible now. The attacks at the border are conducted with the purpose of intimidating the people in border watch actions and the people of the border villages. MAG: Although the Turkish state denies this, it is more or less known that it supports ISIS. However, you say that now even people who cross the border to join ISIS can easily be seen. So in this region it is not hidden that the Turkish state supports ISIS. How does this support work at the border? MD: The Turkish state insistently denies its support for ISIS. However, while we were there, it seemed like each time Turkey made such a denial, a new shipment was being organized at the border. A lot of these shipments were large enough to be easily observed. For example: different vehicles brought “assistance packages” to the border. We were witnesses to the fact that dozens of “service vehicles” with black windows crossed the border. Nobody really wonders what is inside these vehicles. We all know that the needs of ISIS are satisfied through this channel. MAG: Would you please care to explain the historical and contemporary importance, for revolutionary anarchists, of embracing the Kobanê Resistance and Rojava Revolution, especially at a time like this? AY: The Kobanê Resistance and Rojava Revolution should not be considered separate from the long history of the Kurdish people’s struggle for freedom. In the country we live in, the struggle of Kurdish people for freedom has been called the “Kurdish problem.” For years, it was misrepresented as a problem originating in the people and not in the state. We say it again: this is the struggle of the Kurdish people for freedom. The only “problem” here, then, is the state. Kurdish people have been fighting a struggle for existence against the destruction-and-denial politics of the Republic of Turkey for years—and against other political powers in other countries, for hundreds of years. This fight is against the state and capitalism, through the organized power of people. In the slogan “PKK is the people; the people are here,” it’s clear who the political agent is—distinct in each and every individual—and who the organized power is. Ever since we in the DAF solidified our perceptions into struggle, our relationship with Kurdish individuals, organizations, and Kurdish society at large has been one of mutual solidarity. We base this relationship on the perspective of people’s struggle for freedom. In people’s struggle for freedom, anarchist movements have always been catalysts. In an age where socialism couldn’t get out of Europe, when there were no theories authentically declaring a universal right to national self-determination, anarchist movements took different forms in different regions of the world in people’s fight for freedom. To understand this, it’s enough to see the influence of anarchism on people’s struggles in a wide range of contexts, from Indonesia to Mexico. Neither the revolution in Rojava nor the struggle of the Zapatistas in Chiapas fit the classical description of national freedom struggles. Still, our approach does not involve likening or comparing the Kobanê Resistance to any other historical instances. Nowadays different groups mention different historical periods and liken the Kobanê Resistance to these instances. However, it must be known that the Kobanê Resistance is the Kobanê Resistance itself; and the Rojava Revolution is the Rojava Revolution itself. However, if one insists on associating the Rojava Revolution with previous attempts at social transformation, one could investigate the Iberian Peninsula. MAG: Although the resistance in Kobanê is happening outside the borders of the Turkish state, solidarity demonstrations were held in every corner of the world. What is your evaluation of the effects of the Kobanê Resistance – well, the Rojava Revolution, actually – on particularly Anatolia but also on the Middle East and even on a global level? What are your predictions related to these effects? MD: The calls for serhildan [the Kurdish word for uprising] were answered in Anatolia, especially in cities in Kurdistan. Starting from the first night [of demonstrations] everyone in the streets saluted the Kobanê Resistance and the Rojava Revolution against ISIS gangs and their great supporter, the Turkish state. Especially in the cities of Kurdistan, the state attacked the people’s serhildan with its law enforcement and paramilitary associates. The state, with its Hizbulkontra [a wordplay connecting the words Hezbollah and Contra—MAG] associates, terrorized Kurdistan and killed 43 of our brothers. These massacres indicate how much the Turkish state fears the Rojava revolution and the possibility that such a revolution could also generalize in its territory. They attacked with the desperation of fear. The Turkish state and global capitalism have another fear, of course, this one relating to the Middle East region. In the Middle East, despite all the plans, depredations, and manufactured violence, social revolution still managed to emerge. This messed up all the plans of global capitalism and regional states. We cannot emphasize enough what an upheaval it is that, despite all the deprivation, social revolution could emerge in Rojava. This revolution is the answer to all the doubt around whether revolution can happen in this region at all, let alone on a global level. It has strengthened confidence in revolution, especially for the people of this region but also on the global scale. The purpose of all social revolutions in history was to achieve a globally socialized revolution. With this perspective, we called on international anarchist groups to act in solidarity with the Kobanê Resistance and the Rojava Revolution. With our call for solidarity, anarchists from different parts of the world—from Germany to Athens, Brussels to Amsterdam, Paris to New York—held demonstrations. We salute once more every anarchist organization that received our call, organized demonstrations related to our call, and those who stayed here with us in the human chain border watch. MAG: Starting from the first days of ISIS’s attack, the Turkish state-sponsored media made a lot of news that claimed Kobanê was about to fall. However, what they understand after more than one month now, is this: Kobanê won’t fall! Yes, Kobanê did not and will not fall. We from Meydan salute your solidarity with Kobanê. Is there anything else you want to add? MD: We, as revolutionary anarchists, witnessed, lived and are still living the invincibility of the confidence in revolution, even in the circumstances of war in our region. What is happening in Rojava is a social revolution! This social revolution—where borders are abolished, states are being rendered powerless, and plans of global capitalism are disrupted—will also generalize in our region. We invite every oppressed individual to look from the point of view of the oppressed. With this awareness we also invite them to support the organized struggle for social revolution. This is the only way to fertilize the seeds which were planted in Rojava and to live the social revolution in wider regions. Long Live the Kobanê Resistance! Long Live the Rojava Revolution!